The Iron Chef is offering one dish. 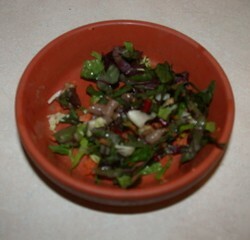 The bitterness of the organic mixed greens is gently scented by the slime of the chopped nightcrawler, while the grated carrot and chard add essential nutrients for a growing turtle. Tasting: The turtle ate the nightcrawler pieces but ignored the veggies. A bitter defeat for the Iron Chef! Epilogue: When the turtle was finished eating her worms, we added a chopped strawberry to her plate and put her in it. She turned to clomp away, stopped, did a double take, and went back to eat the new treats. Though this morning most of the strawberry pieces were still there. Box turtles are finicky beasts, even when you’re trying to convert them to a more vegetarian diet at the age of three.